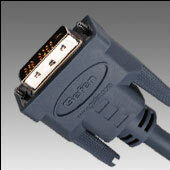 Copper Based DVI Cables: Copper based DVI cables are available in lengths up to 50 feet. These cables are HDCP compliant. HDTV Resolutions Supported: The 1-30 foot cables are good for the following resolutions: 480i, 480p, 720p, 1080i, 1080p. The 40 and 50 foot cables are good for resolutions up to 1080i. With a DVI Repeater/Booster the 40 and 50 foot cables are good for resolutions up to 1080p. Computer Resolutions Supported: The 1-15 foot cables are good for resolutions up to 1920x1200. The 25-50 foot cables are good for resolutions up to 1280x1024. With a DVI Repeater/Booster the 25-50 foot cables are good for resolutions up to 1920x1200.